You’ve devoted time, money and staff (and maybe consultant resources) to a public engagement effort about an important local plan, issue or policy. But so what? Here are questions to help guide a communities’ evaluation of its public engagement efforts. Local officials are increasingly using a wide range of public engagement strategies to help them inform, consult with and deliberatively engage residents on topics such as land use, budgeting, housing, sustainability, health and environment, public safety and much more. While there is a growing body of literature and experience about how to engage the public, there are few practical tools to gauge the success of these approaches. 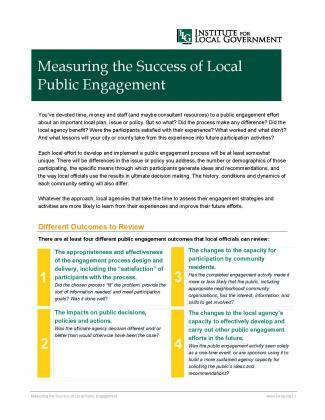 Recognizing that local officials and staff have limited time and resources, the Institute for Local Government has created these online Rapid Review Worksheets to help local governments assess how well their public engagement processes worked. 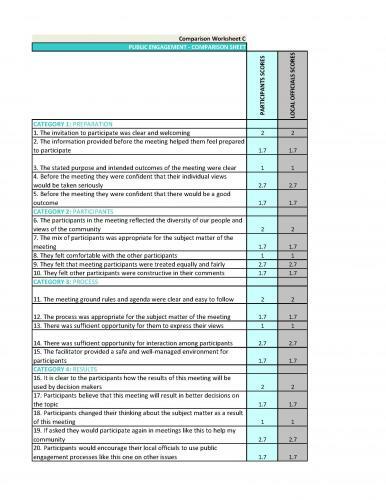 The International City/County Management Association’s (ICMA) capstone team was asked to evaluate the citizen engagement programs for the city of Montgomery, Ohio. ICMA has prepared a report, Measuring Community Engagement, which offers a guide to define success, measure efforts and share stories. Who says you can’t quantify public deliberation? It is true that quantitative measurement hasn’t been a strong suit of the field. It is also true that some of the most significant impacts, such as policy changes, are inherently difficult to quantify. But at this point, enough scholarly research and evaluative work has been done that it is possible to pull together a concise statistical glimpse of the kinds of things these projects accomplish. Tools like SeeClickFix tap into the capacity of citizens to be ‘intelligent sensors’ of their environment, allowing them to report problems like potholes and graffiti. Can this same thinking, and some of the same technology, allow citizens to gather, track, and analyze data on public participation?